City Lodge Hotel Dar es Salaam in Tanzania is opened its first batch of 41 rooms on 16 November 2018 on the first and second floors. The hotel will have 148 rooms in total when complete. Anneke Pienaar is general manager. Standard room rates, not on special, are: 1 pax: USD 175 and 2 pax: USD 220. 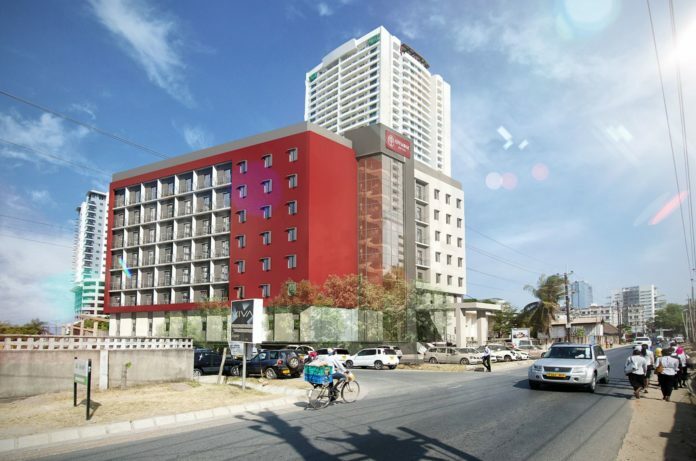 The newest hotel in the Group is located on the corner of Magore and Vijibweni Street in Upanga, 13km by road from Julius Nyerere International Airport and close to the city centre, embassies, Aura Mall, Botanical Garden, National Museum and other cultural and social points of interest. The hotel features three boardrooms, with Boardroom 1 accommodating up to 18 pax and Boardrooms 2 and 3 up to 10 pax each (these rooms open into one space). City Lodge Hotel Group’s own brand #Café restaurant serves breakfast, lunch and light evening meals and there is a sundowner bar and swimming pool for outdoor relaxation. The hotel has wireless Internet access, a fitness room and 24-hour reception and check-in services. Rooms are spacious and air-conditioned, with queen or twin beds and one suite with an interleading room. Interleading rooms are available. Five rooms are equipped to meet the needs of guests with reduced physical ability. Other in-room features include: television with selected DSTV channels, bathroom with shower (bath in selected rooms), tea and coffee making facilities, electronic safe large enough to fit a laptop, and a desk with lighting and plugs for easy connectivity. The City Lodge Hotel Group has grown its footprint in Africa considerably, having opened 147-room Town Lodge Windhoek in Namibia; 104-room Town Lodge Gaborone in Botswana; and 171-room City Lodge Hotel at Two Rivers, Nairobi in Kenya in 2018. These add to the Group’s existing properties in Kenya, the 84-room Town Lodge Upper Hill, Nairobi and the 120-room Fairview Hotel, Nairobi. Construction is underway on the 148-room City Lodge Hotel Maputo in Mozambique, expected to open in 2019. In South Africa, construction is underway on the 154-room Town Lodge Umhlanga Ridge in KwaZulu-Natal and City Lodge Hotel at OR Tambo International Airport in Johannesburg recently added on 62 additional rooms. Once the new hotels are fully operational, the group will offer 7,902 rooms at 62 hotels in six countries in East Africa and Southern Africa.